More than half of the tickets for the 2018 PyeongChang Winter Olympics have been sold, the local Olympics organizing committee said Sunday. 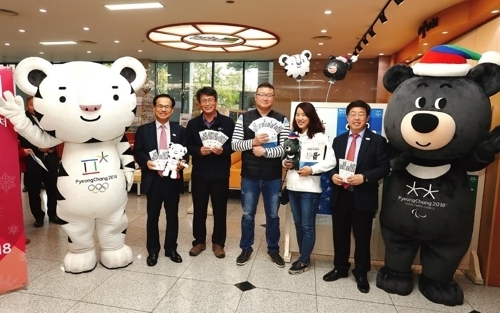 "Around 555,000 tickets for the opening and closing ceremonies, as well as sports competitions, had been sold as of last Friday," the organizing committee said. The sales account for 52 percent of the committee's sales target of 1.07 million, according to the committee. The Winter Games are scheduled to run from Feb. 9-25. The sales rate reached 31 percent as of early November before Olympic torch relay events boosted offline ticket sales, the committee noted. Ticket sales may pick up further speed down the road, given the accelerating sales rates shown ahead of the 2014 Winter Olympics in Sochi, Russia, where the final rate topped 90 percent, the committee also said. Tickets for short track and figure skating have been the most popular with almost no seats available as of recently, it added.